The Media Center serves as the primary foundation of current educational and recreational reading resources for students and teachers. Media classes support technology integration for student learning in the classroom using 1:1 technology. Sound literacy skills are taught for researching and assessing valid information in an age of ever-increasing knowledge and rapidly changing technology. A variety of digital products are available on campus and remotely to enhance student learning. Teachers may schedule additional class time and students are encouraged to browse, relax and read in the Media Center. 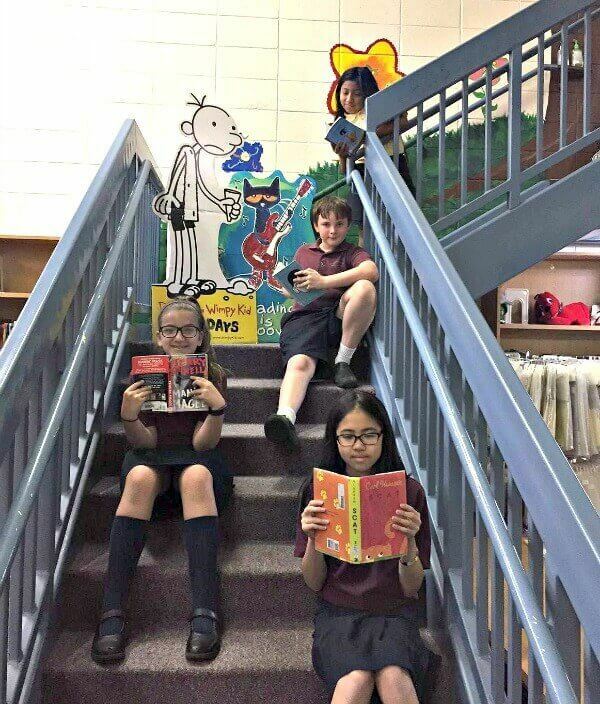 The “Archdiocesan Battle of the Books” reading competition and book fairs provide opportunities to advance reading development. Students discover a variety of fiction and nonfiction books during their thirty-minute class each week. They listen to stories read by the Media Specialist, use the online services to search the media catalog, check out books and read e-books. These students meet weekly for forty-five minutes as part of the Literature class. They’re directed to check out resources to assist in their academic studies as well as personal and career interests. Instruction focuses on practicing the concepts of effective research, website evaluation, citing sources, locating library resources, speech preparation and outline/essay creation. Twice a year our media center holds a book fair. Students come with their classmates to pick out a favorite book or two. During the book fair, we host Doughnuts with Dads so fathers can shop with their children to share in the fun of discovering a new selection. During our Spring Book Fair, students can purchase books for their summer reading list to get an early start on next year. Third graders are excited about being the Kindergarten helpers at lunch. It is the first year they can participate in Battle of the Books and join the basketball team. They look forward to our Lenten retreat where they dress up as they lived when Jesus lived and participate in a Seder meal. We supply lunch items and snacks for Family Promise Of Gwinnett. We collect these items for the families that are staying at SJN Church. Family Promise houses needy families in churches and helps locate housing or secure jobs for family members.